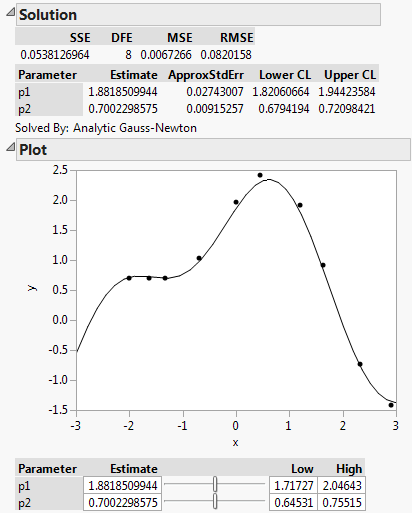 In his Walking Randomly blog, Mike Croucher shows how to fit a simple nonlinear curve using five different statistical programming libraries: R, MATLAB, Maple, Julia and Python/numpy. The idea is to provide concrete examples for a commonly asked modeling question that is simple to state but not so simple to solve. So how would you do the same thing in JMP? Normally, you would start with a data table and use the Nonlinear platform under the Analyze menu to interactively launch the fit. For a model like this, which isn't built-in to JMP, you could add it in a formula column and use that in the Nonlinear dialog. But like most everything in JMP, it can be completely driven by a JSL script if you want. That script produces the following interactive output. Some of the other languages require a bit of extra work to get the confidence intervals, so it's nice to see it's just one option away in JMP.